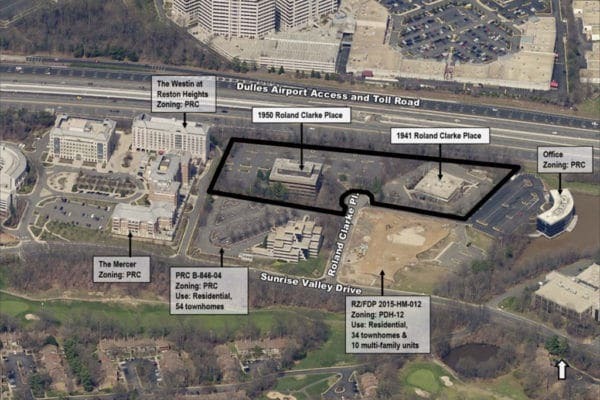 The redevelopment is set to replace a vacant, two-story office building at 1941 Roland Clarke Place with a 308-unit residential complex just south of the Dulles Toll Road. Fairfax County’s Board of Supervisors approved Woodfield Acquisitions’ redevelopment of Roland Clarke Place at its Tuesday (Dec. 4) meeting. The seven-story apartment building will be about a mile between the Wiehle-Reston East and Reston Town Center Metro stations. Plans for the building include two interior courtyards, an outdoor pool, seating on a third-floor patio and a 409-space, eight-level parking garage behind the building. About one-third of the new development is slated to remain as open space. The existing office buildings on the site were constructed in the early 1980s. The board delayed making a decision after the project’s public hearing on Nov. 20. The Fairfax County Planning Commission unanimously approved a series of proffers for the redevelopment on Nov. 15. The board also greenlighted three other developments in Reston, including the Midline and the Tall Oaks Village Center, at the Tuesday meeting. RestonNow.com is a WTOP news partner. Subscribe to RestonNow.com’s newsletter today.